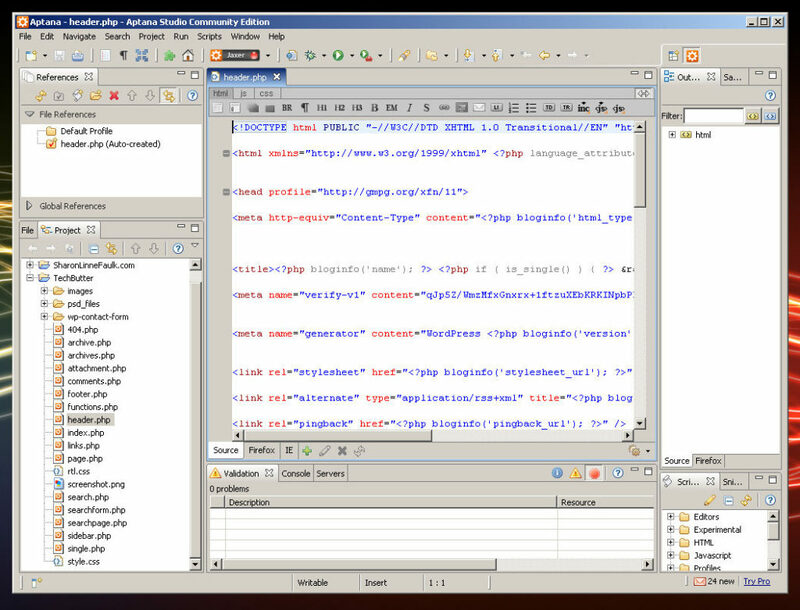 Yesterday morning I downloaded Aptana, it is a web development application much like Macromedia Dreamweaver. I've been using it most of the day to work on a new project and I really like it a lot. I think it is very close to being able to steal away Dreamweaver's customers. Best of all its a free application. Even better than it being free is that it’s a cross platform application. You can run it on Linux, Mac and Windows. I thought I would share with you some of the things I like and some of the things I don't like about it. When you first startup the application you are presented with a getting started guide, I guess you could call it. 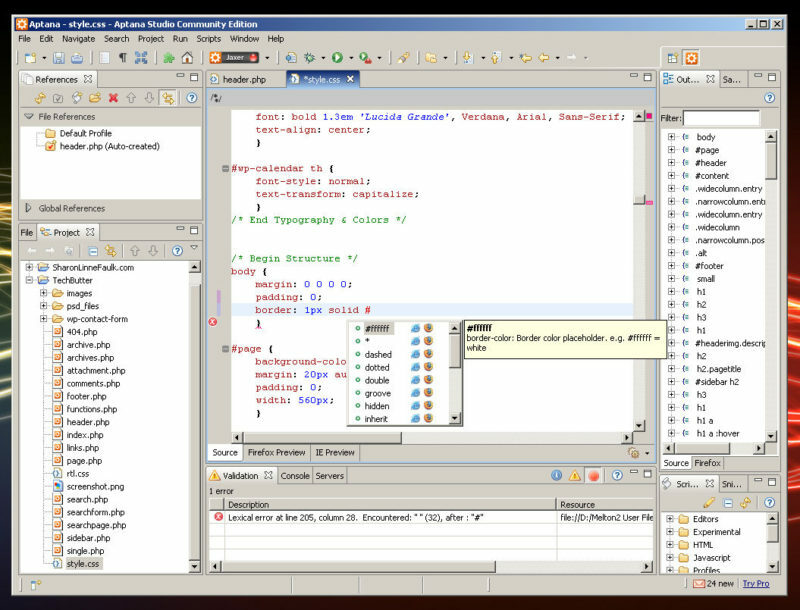 It shows you where everything is, such as where the files are located, where the code assist view is, where the code checking is. Things like that. It’s really is useful if you're switching from another program. Whenever you are typing code it will pop up (unobtrusively) and tell you whether the code will work with Firefox or Internet Explorer while it also suggests code to you. I find that very useful and I personally think it would make a person become a better web developer. Also, whenever you are typing code, if that code is incorrect it will display an error message down in the error checking area of the program. It doesn't come up and beep at you and the best part of it is that it is live, you don't have to wait until you've wrote a whole page of code to find out there is a problem. One of the other features that I found extremely useful as I was using Aptana yesterday was the code outline view that is always present on the right side of the screen. For example, yesterday I was working on a CSS file for a WordPress website. I needed to quickly get to the part of the code where I defined the style for the sidebar. You can simply scroll down the code outline view and find where you've defined style for a particular element. I really found this to be very useful. Another feature I found useful but probably not one that I will use very often. I could be wrong, but I didn't use it any yesterday other than to see what it did. There is a way to change the perspective of your coding environment. You can change it to a debugging mode, a team synchronization mode and a resource mode. I'm interested in seeing what the team synchronization mode does and I wonder how it would work. 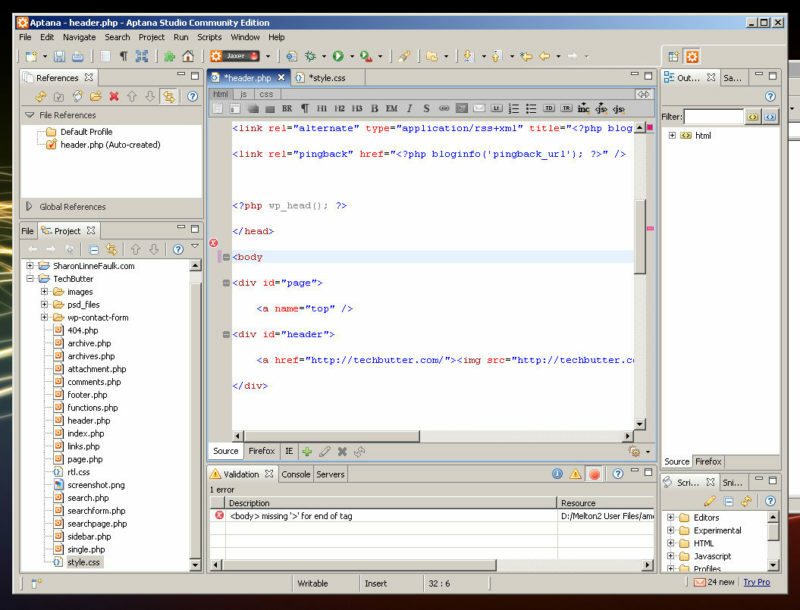 As I worked with Aptana yesterday I realized that I was able to more quickly identify problems with my code and also, I was able to see errors in my code from the previous day that I never saw in Dreamweaver. One of the reasons for this is because of the layout of Aptana. Its got the code centered on the screen. The second reason is due to the live error checking feature. With Dreamweaver I always forget to open the validation panel and validate my code. Like Dreamweaver, with Aptana you can define your website into a project. This bundles all of your files together into a folder. I really like this feature a lot. The only problem that I had with it was that whenever I would close Aptana and re-open it I could not figure out how I could re-open that project. You can navigate to the folders using the file viewing window but I could not figure out how to re-open a project. Something that some people will immediately be disappointed with if they use Aptana is that it does not contain a WYSIWYG environment. For me this is fine because I never (try not to) use the WYSIWYG environment in Dreamweaver. If you do use that feature of Dreamweaver you will miss it in Aptana because it is simply a coding program. I really like it. I am planning on at least trying to use this as my main web development program. I know there are still a few problems with it but from what I saw yesterday, I really like it. I also think that there is finally a shift for more good free and open source web development applications that are cross platform. Also, they're not even a version 1.0 application yet and they've already got a lot of great features. I'll definitely be happy to see what they can come up with between now and version 1.0. Article update: Thursday, September 11, 2008: I’ve updated this article with new screen shots. Unfortunately, I was unable to acquire a copy of Aptana build 0.2.0.10299 which is what the review above is based on. I’ve been re-doing the screen shots here on TechButter so that they all look good with the new theme. In my opinion, the layout and design of Aptana has only been slightly altered. Since publishing this article in 2006 I have been using Aptana a lot. There was a while when I was developing with Taco HTML Editor but now that I have my PC back up and running I am using Aptana again. I would have used it on the Mac but it was way too slow on there. I am pleased to report that the problem I mentioned above regarding the project management feature has been fixed and improved. You can now create a project and easily return to it after you close and re-open the program. There are a couple of things that bug me with the latest version. First, as you open files there is a Java program that opens called “theAwtToolkitWindow.” I personally find it really annoying. Second, I wish there was a way to turn off the code auto complete. Otherwise, I think it’s a great application and they are constantly improving it. There are now two versions. A free version and a professional version which costs $100. They have additional purchasing options. Also, they have a couple of new products: Aptana Jaxer and Aptana Cloud. If your business has an assortment of old computers that are planned for removal, you may want to re-consider that plan once you learn more about Wtware. What is it? Wtware allows you to take a really old computer and turn it into a Windows terminal workstation, with very little effort and nothing to install on the client workstation. The only requirement is that you have a Microsoft Windows Server (2000 or 2003) that has Terminal Services Server installed. Once you get your server set up for accepting clients, you can then insert a CD, floppy, USB thumb drive or use your network card to boot onto the server and use it as a normal workstation. There is nothing to install (unless you want to) and the only thing the computer is doing is displaying to you the desktop on the server. The beauty of it is that you've saved money by reviving old hardware and the added benefit of only having one machine to install software & updates on. Also, since the machines are now running off the server they will be much faster and to make them faster you will only have to upgrade one machine. Unfortunately I ran into problems while I was testing out the software. The first problem arose when I tried testing the software out on my laptop. My laptop is quite old. I do have a PCMCIA network card installed in it, however, Wtware cannot detect my network card during the bootup process but that is the case with almost any other operating system I have had on it, even Windows. The second problem I came across was with the other computer I have that I tried it on. It did detect the network & video cards without any problems. However I could not get it to accept a default configuration, it seemed as though it wasn't happy with any of the configurations that I chose. It kept asking me to go through each test for the video card again and again even though I had already entered the information into the configuration file on the server for the specs of the machine I was trying to boot from. Fortunately, I did have a successful test of the software. I opened up Vmware server and created an empty virtual machine. I booted the virtual machine using the Wtware ISO image I had made and previously burned to CD to try and boot the other two machines. This time it worked. I was able to configure everything correctly and in a short amount of time I was booted onto my server. Wtware is fairly easy to set up. All I had to do was to install the software and then create a boot disk. You'll follow a wizard to enter DNS & DHCP information. Once you do that you'll burn the ISO image to a CD, take it to the computer you plan to use as a terminal and run some tests to see which settings will work best on that terminal. After that, you'll return to the server and make a configuration file (the name of the file will be that terminals MAC address). You'll enter a few settings in there, return to the other computer and you should be able to boot that computer onto your terminal server, very quickly. Although I think this is a great application I do have a few gripes about it. The first gripe that I have is that the license you purchase can only be used on ONE network card, one MAC address. That means it is tied to that network card, forever. The license is $20. If I'm going to spend $20 on something I should be able to use it on any machine I like and move it to any machine I like. Now, if the license was down in the $1 or $2 range, I might not care. This is one case where I think they should charge a fee for their software ($20 maybe) and then charge a much, much lower rate for the licenses ($1-$2). The free version also has banner ads that are obtrusive. I realize that they need to be able to get people to upgrade to the paid for version, but why does the ad have to be obtrusive? They are marketing their free version to libraries and schools who can't afford their software. After my gripes section above a thought comes to mind. Would I actually pay for and use this software? No, I probably wouldn't. Why? Whenever I need to connect to a Windows terminal server and the machine I am using does not have an operating system already; I would probably simply insert a live Linux CD (DSL, SLAX, Puppy, Ubuntu, etc) and simply use the Terminal Server Client software that is already pre-installed and connect to the remote server. Granted, this process is not as fast as Wtware, but it would work and you could use this alternative on as many machines as you like, without banner ads. Now, I realize even though this program isn't for me that there is truly a market out there for it. I can see businesses that are needing more computers but can't afford brand new computers using this. It is honestly a lot better than waiting on a live Linux CD to boot, then connecting to the server, every time you need to use it.